What is the SCI Fidelity Street Team? Promotion at the grassroots level is essential to what we do here at SCI Fidelity Records. Peer-to-peer sharing of information about our upcoming albums is a wonderful and informal means of reaching our desired fan base. Joining SCI Fidelity’s Street Team is a great way to become a part of that sharing process. 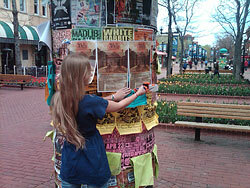 Members of our street team make sure that posters are put up around town, handbills are handed out at like-minded shows, and spread a general good vibe about an upcoming album and/or show. In addition, a large part of our promotion is conducted online by our Digital Street Team, who spread the word about our albums and artists throughout the Internet. In today’s internet-driven world, digital promotion is key, and utilizing promotional avenues such as music blogs, message boards, and social networking sites are a great way to reach fans no matter where they live. Digital Street Team Representatives are encouraged to be creative with their online promotion, as there is no limit to how far and wide information can be shared across the Internet. In return for helping out and leaving detailed feedback, many Street Team Representatives get FREE albums, merchandise, and even tickets to shows. We at SCI Fidelity, and each of the artists we work with, have ultimate respect and appreciation for the fans, and know that we absolutely couldn’t do it without you. Thanks in advance for helping to support the music!